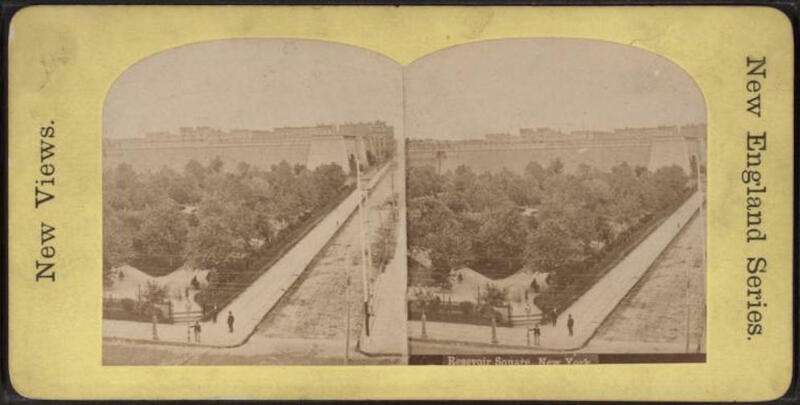 Here are three stunning stereoscopic views of old Reservoir Square, the park next to the Murray Hill Reservoir that became sadly vacant after the fiery destruction of the Crystal Palace. These stereoscopes — ancestors to the View-Masters which some of you may remember from childhood — were taken in 1865. Now without its dazzling occupant, the park was landscaped for recreational use, but its location next to the imposing Egyptian-style reservoir made it a grim place to wander about in at certain times of the day. During the 1860s this was still a sparsely populated area, even as Fifth Avenue on the other side began slowly filling up with luxury mansions and townhouses. Just a couple years earlier, a horrible event occurred just nearby. During that violent week of the Civil War Draft riots in July 1863, the Colored Orphan Asylum (just across the street, between 43rd and 44th Streets) was burned down by the mob, the children fleeing for their lives. It’s a bit unsettling to look at this pictures from so long ago and realize how close they were to this terrible stain in New York history. Many years after these pictures were taken, the park would be renamed after one of the city’s most prominent citizens — William Cullen Bryant. Pictures courtesy the New York Public Library. Presumably these originals are located in Bryant Park today!